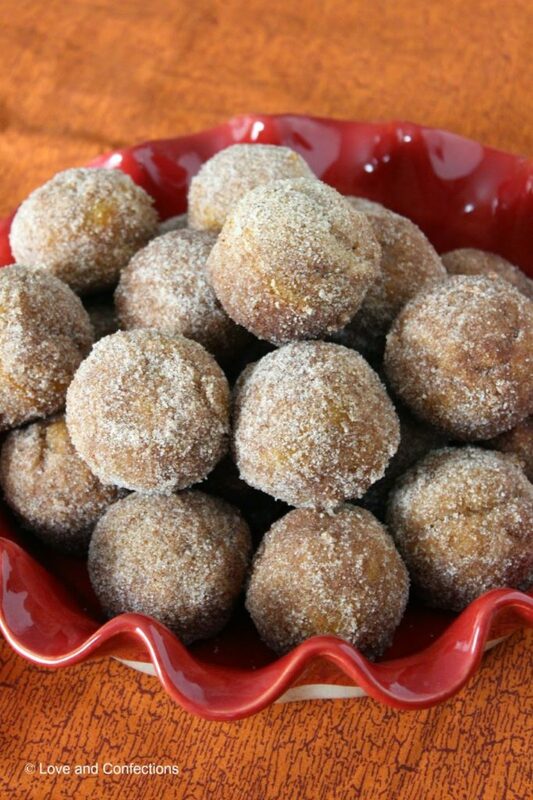 Bite-sized Baked Pumpkin Donut Holes are absolutely delicious and perfect for breakfast! Hi and welcome to day 2 of #PumpkinWeek. We are celebrating our love of the season with a whole week of pumpkin goodies, leading up to National Pumpkin Day. 17 Food Bloggers have come together to share over 65 recipes with you. In addition to homemade pumpkin puree, pie, and cookies, we are also sharing savory pumpkin dishes like hummus, chili and pumpkin corn chowder. Come back every day for #PumpkinWeek recipes. You can also find these great recipes and more on my Love and Confections’ #PumpkinWeek Pinterest Board! Yesterday I shared my Pumpkin Loaf and today I have one of my new favorite recipes to share with you. 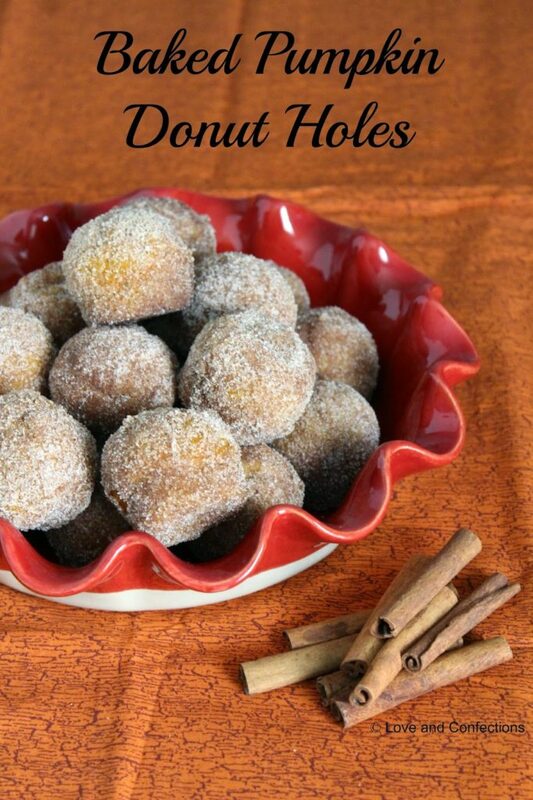 If there is one pumpkin dish you need to make soon, it’s these Baked Pumpkin Donut Holes. They are absolutely delicious! The batter is so moist and the spice and sugar coating gives them great flavor. My Dad, who is a vanilla cake and chocolate brownie kind of guy, usually only likes pumpkin in his pie. He’ll try all the baked goods I make to taste them, but usually goes back to the originals. He couldn’t stop eating these, and neither could I. They are the perfect size for breakfast or an afternoon snack. These babies didn’t last long and they are definitely going to be made many more times this season. I am even planning on making them for my Thanksgiving Day brunch for family. 1. Heat oven to 350F. Prepare a mini muffin tin with baking spray and set aside. 2. In a medium bowl, whisk the Flour, Baking Powder, Salt and Pumpkin Pie Spice together and set aside. In a large bowl, whisk together the Vegetable Oil, Brown Sugar, Egg, Vanilla Extract, Pumpkin Puree and Milk until combined and smooth. Slowly add the dry ingredients into the wet ingredients and whisk until combined. 3. Using a small scoop, pour the batter into the muffin tray. Bake for 10-13 minutes or until the muffin bounces back when touched and a toothpick inserted into the center comes out clean. Cool in the muffin tin while you prepare the coating. 4. Melt the Unsalted Butter in one bowl. 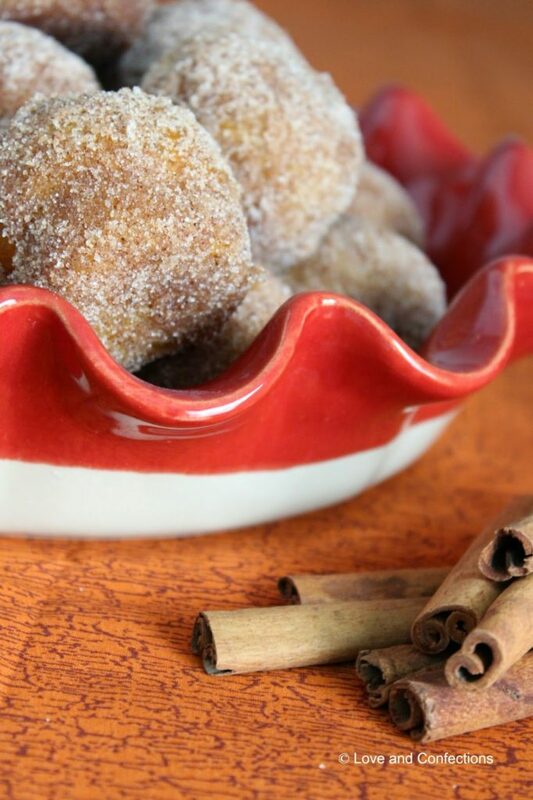 In another bowl, combine the Granulated Sugar, Cinnamon and Pumpkin Pie Spice. Roll each muffin in the butter, shaking off excess, then roll in the cinnamon-spice mixture, shaking off any excess. Can be stored in an airtight container for up to three days, if they don’t get eaten first. They would love them. So delicious! Every fall I say I am going to use my mini muffin pan to make baked doughnut holes but I never do for some reason. They look so good! Make this the Fall. You have got to make them. You won't regret it. How have I never thought to BAKE donut holes?!? Genius, Terri!